When the news first broke of Jameis Winston’s three game suspension a few weeks back, I remember hearing it in the car with my 13 year old daughter. She saw my surprised reaction and asked me what happened? I was too ashamed and uncomfortable to tell her the specifics of what he did to a female Uber driver but “generally” explained the situation in that he “hurt” another woman’s feelings. Can’t say I disagree anymore. Some people refused to like Winston before this incident, now the anti-Jameis crowd is growing and for good reason. Winston’s actions are a broken record. He had a short leash when he initially put on a Bucs uniform but now he’s out of chances. Frankly he’s lucky he only got three games. Figuring out Winston is as puzzling as trying to solve the NFL’s suspension system which is as inconsistent as our President’s tweets. How on earth does Winston receive less games than Tom Brady, whose biggest crime was deflating footballs—and we wonder why this league has lost all credibility? Now Bucs nation is deflated, especially those who stuck with Winston while many didn’t, including me. I was wrong about Winston. I thought the Bucs should have drafted him number one overall over Marcus Mariota. I thought many of his transgressions in college you could just chalk up to immaturity. I also thought it was impressive that he seemingly spent his first few years as a professional staying out of trouble. The fact is just like politicians or actors or any other public figure–we don’t know these people. They can be great in the community, great at a press conference but we don’t see them behind close doors. I still believe most athletes are good people, furthermore I believe most people are good people, but the exceptions to the rule always hurt the majority. 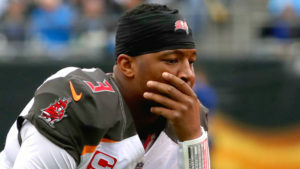 As polarizing as Warren Sapp was in his playing days and even his life there after—you knew he was a bad guy but Winston was much tougher to peg. You meet him in person, he’s friendly and charismatic. You see him around kids and you want to believe this guy is the real deal. 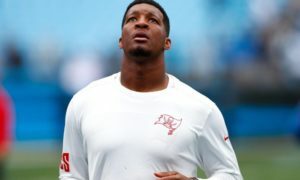 He’s a unique personality in the way he would learn everyone’s name in the building and seemingly cared—yet you have the other Winston off the field. I remember covering an event back in April where Winston did an admirable job creating a “Dream Room” for a Tampa elementary school He donated projectors, iPads and several gadgets to kids who never had those kinds of resources. His likeness was painted on the wall in the classroom where the kids were over the moon excited just to high five and interact with the Bucs young quarterback. Winston went on to give a passionate and inspiring speech to the kids about living their dreams. What do those teachers and kids think about Jameis now? What do those teachers tell those kids now? I kept thinking that day, I really hope this guy is for real, I hope this isn’t all for show. Many still defend Winston saying the Uber incident happened over two years ago and since then he’s on his way to becoming a husband and father, he’s a different guy. One problem with that timeline, he sat in front of the media just a few months back when the reports broke of the “alleged” groping incident and he adamantly lied to all of us in the room. He called the Uber Driver “confused” and in a statement said the accusations were “false” not once but an amazing four different times. That wasn’t over two years ago, that was….. seven months ago. Seven months later, Winston’s story changed dramatically–he’s now apologizing to the Uber Driver and admitted albeit not fully that something took place. It’s hard to trust him again. This is a tired timeline for a player who’s given too much drama and only 18 wins in four seasons as a starter. 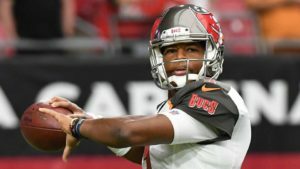 If he lied publicly, who’s to say he didn’t lie to the Bucs owners, his general manager Jason Licht who has backed him like no one else has, his head coach Dirk Koetter and last but not least his many teammates who just want to play football and are tired of answering questions about their so called leader. 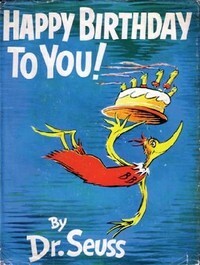 He quoted the several passages that hit home with him the most regarding himself and his play. Waning on Winston, the first stop in another run around the Naborhood, as usual thanks for stopping by. 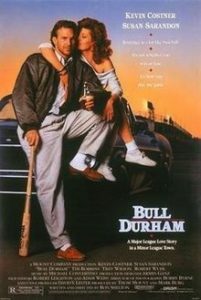 BULL DURHAM: With apologies to Field of Dreams, For the Love of the Game and Major League, Bull Durham for my money is still the best baseball movie ever made. Amazingly it was made 30 years ago but the interesting part it was almost left on the cutting room floor. In a recent interview with Dan Patrick, Kevin Costner said it was close to never getting shot, was rejected soundly a number of times and he almost took the lead role in the football flick “Everybody’s All-American,” but at the final hour he and the film’s director and screenwriter Ron Shelton made it happen. Costner also told Patrick he was a decent high school baseball player but didn’t hit his first home run until he was taking batting practice for the movie. A movie which had so many classic lines and characters but for me what made it was the great interaction between Crash and Nuke played by Tim Robbins. Hoosiers remains my favorite sports movie of all time but Bull Durham is a solid runner up. CATCHING CALIENDO: There is no one on the planet like him and I finally got a chance to see him in person. Frank Caliendo live was everything I expected and more. There are a lot of impersonators out there but Frank Caliendo is clearly the best. 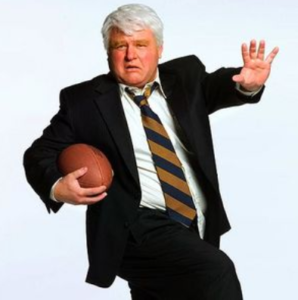 Discovered by Jimmy Kimmel, Caliendo came on the scene doing John Madden where today he is full aware that many think of Madden more as the name on video games than a Hall of Fame Head Coach so he’s had to adapt and constantly reinvent himself. Adapting he has where his go to’s are Jon Gruden (my favorite), Charles Barkley and George W Bush. He told the crowd he’s had to be sensitive to the #metoo movement as he can’t get the same laughs from Morgan Freeman and Bill Cosby as he used to. Caliendo is also reluctant to do his Robin Williams sensitive to the former comedian’s suicide. But he’s always creating new voices while trying to still become more than just an impersonator. It was interesting in his act that he wants to tell more jokes and life experiences but could tell the crowd just wanted to hear the voices. He still pulled everything off. The first “impression” wasn’t an impression. Caliendo walked out on stage and clearly everyone in the audience was surprised by how short he was .You would think Caliendo would be used to such a reaction but it seemed to surprise him throughout the show as he kept going back to it for more laughs. He ended the show by really bringing the audience in just asking for any requests they have. People yelled out all kinds of names and he didn’t disappoint. 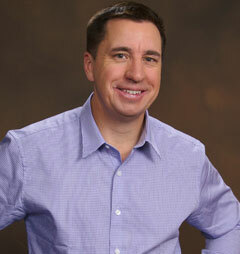 The biggest reaction was his “Jim Rome” which like everything else he does was spot on. Look forward to seeing him again. HALL & OATES: This spring was fun finally seeing Caliendo and I also appreciated finally seeing one of my favorite bands of all time. C’mon do your know anybody who doesn’t love Hall & Oates? Frankly for my money, is there a more underrated band of all-time ? The ageless duo sold 40 million records, making them the best selling duo of all time. Better than Simon & Garfunkel, Waylon & Willie and wait for it….the Captain and Tennille. 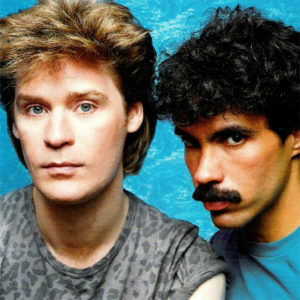 Hall and Oates hail from Philadelphia where the story goes they met in an elevator both trying to avoid a rough gang fight. They both went on to study music at Temple, where they were roommates . One of their apartments has a mailboxes which read “Hall & Oates,” —that’s where they got the name. Yes Daryl Hall’s real name is Daryl Franklin Hohl, but they felt Hohl and Oates didn’t have the same sound to it, I would agree. These guys have been grinding for years. I remember they were a free act after a Rays game a few years ago which is amazing given they have six number one hits and are in the Rock and Roll Hall of Fame. Does anything scream eighties more than Hall & Oates? From Private Eyes to Maneater to Out of Touch , I Can’t Go For That and Kiss on my List–every song takes me back to those treasured middle and high school days. Great times and great music. NOBODY ASKED ME, BUT…. : Well we have seen some tough finishes in college sports over the years but I think we may have a new leader in the clubhouse. Yes Chris Webber’s “Timeout” was devastating to watch, Warren Morris’s game winning home run was brutal for every Miami Hurricane and for that matter so was Doug Flutie’s Hail Mary but I digress. The recent College World Series saw Arkansas one out away and ONE STRIKE away from the title when Oregon State lifted a foul ball to left. Three Hogs were in position to make the play but the ball dropped anyway. How many times do you see it in baseball when that happens, it often comes back to haunt you? To the Beavers credit they made the most of their second chance following that up with a base hit to tie it and then in my opinion the most gut wrenching dagger in college sports history—a game winning homer which should never have happened. Much like Bill Buckner’s World Series blunder back in 1986—it wasn’t the deciding game but it seemed that way. 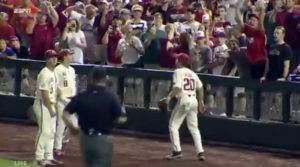 Like the Red Sox that year, Arkansas would lose the clinching game after such a heartbreaking defeat. Arkansas had been 44-0 when leading after eight innings….. EXTRA POINT: I really appreciate what the new era of late night hosts have to offer. Fallon, Kimmel and Colbert all bring a new creativity to the table but James Corden’s “Carpool Karaoke” is the best idea since many of those Letterman skits. He’s done some great segments with many great performers but when you have time, check out his latest ride around London with Sir Paul McCartney—it was fantstic television. 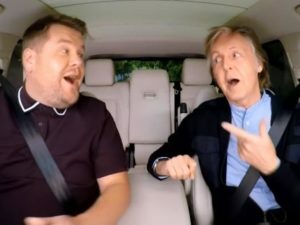 I was already a big fan of Corden and McCartney’s—now I’m even a bigger one. PHOTO CREDITS: Sporting News, Getty Images, Pro Football Weekly, USA Today Sports, Mental Floss, Awful Announcing, Amazon, Si.Com, CBS & Orion pictures.